D. Lorraine Speraw, 90, of Wellston, Ohio, passed away peacefully on Friday, April 12, 2019, at Jenkins Care Community in Wellston. She was born in McArthur, Ohio, Aug. 24, 1928, to the late Floyd Albert Murray, Sr. and Cora Bishop Murray. 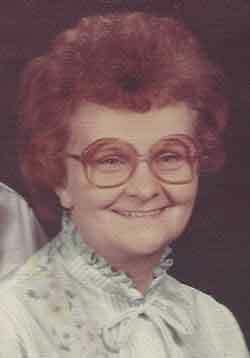 She was a 1946 graduate of Allensville High School and married her husband, who died in 1989, Robert D. “Buck” Speraw. She and “Buck” raised four children: Tim Speraw, Gary (Kathy) Speraw, Donna (Jack) Speraw Thacker, and Sandy (Jim) Speraw Ervin, all of Wellston. Lorraine was employed by the Hercules Trouser Company and H & H Lumber Company in Wellston. She also assisted at Speraw's Food Market when necessary. She retired following 25 years with the Wellston Sundry and News where she was assistant manager. She was a member of Zion #3 Church. She enjoyed sewing and baby sitting with all of her grandchildren and great-grandchildren. Besides her parents and husband, she was preceded in death by three brothers: Floyd Murray, Jr, Lloyd Murray, and Richard Murray; three sisters: Patricia Murray, Doris Dyer, and Deloris Bethel; and a grandson, Christopher Alan Thacker. Besides her children, she leaves behind her five grandchildren: Stephanie Davis, Bryan Thacker (Bethany), Tracey Hughes ( Josh), Brody Speraw, and Brogan Speraw; her nine great-grandchildren: Tasha Alley (Brandon), Noah Davis, Kohde Davis, Avery Hughes, Anna Hughes, Konner Davis, Ace Hughes, Harper Thacker, and Hadley Thacker; her two great-great-grandchildren, Zoiey and Stetson Alley; two sisters, Betty Maxwell of Columbus and Mary Lou Lenegar of Wellston; sister-in-law, Clara Moshier Murray of McArthur; several nieces and nephews; and two very special people, Ann Wood of Wilkesville and Tammy Wires of Wellston. The family received friends at the Jenkins Funeral Chapel in Wellston on Monday from 2 until 8 p.m. Services were heldTuesday at 1 p.m. at the Jenkins Chapel with Pastor Ed Barney officiating. Burial followed in the Ridgewood Cemetery in Wellston.